Review of Dogfish Head Ta Henket | Beer Apprentice - Craft Beer News, Reviews, Interviews and Info. For today’s craft beer review I’m going to be drinking the Ta Henket brewed by the Dogfish Head Craft Brewery located in Milton, Delaware. This beer has been talked about quite a bit over the last several months, so I decided to pick up a bottle and try it for myself. From the website, dogfish.com, I found this tidbit of information regarding the Ta Henket. For this ambitious liquid time capsule, we used ingredients and traditions plucked from Egyptian hieroglyphics. 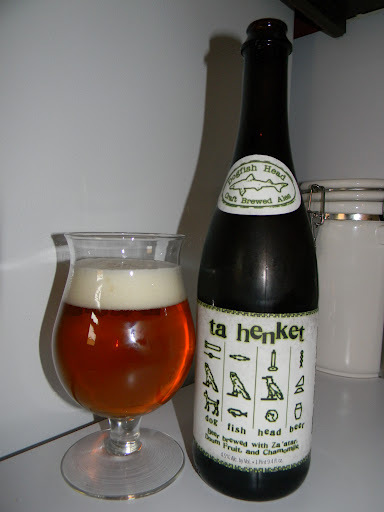 Ta Henket is brewed with an ancient form of wheat and loaves of hearth-baked bread, and it’s flavored with chamomile, dom-palm fruit and Middle Eastern herbs. To ferment this earthy ancient ale, Sam and friends traveled to Cairo, set out baited petri dishes and captured a native Egyptian saccharomyces yeast strain. “It was the strangest picnic I’ve ever been on,” he said. We first brewed Ta Hanket as an addition to our Ancient Ales lineup in late 2010. It enjoyed a full bottled release in December 2011. The Ta Henket comes in a 25.4 oz. bottle and it has an ABV of 4.5%. It poured a very clear, burnt orange to dark golden color. It had a white crown of good size that was kind of fizzy and soapy with small tight bubbles. The retention time was mostly average and the lacing left behind seemed to be just adequate. The nose had a very clean grain and grass characteristic. Some type of spice was noted and hints of fresh white bread and yeast gave it a decent “earthy” tone. It smelled quite floral and fruity too, although I wasn’t able to pinpoint exactly what kind of fruit I was getting. Deeper in the aroma I found it to contain a hint sweet corn hominy. Overall, it seemed well balanced, but not over the top or too crazy. The taste was, again, very clean and fresh with the tones of grain, grass and white bread. More of the herbal and yeasty components as well as the corn hominy and floral accents intermingled with the spicy bite made the flavor very similar to the bouquet. After a few moments I began to find that the grain tasted very much like cereal grains. Almost like Cheerios or something. The label states that it is brewed with Chamomile, but I don’t ever recall having tasted that before, so I can’t say with any certainty that I found that in the flavor. It did seem like it was balanced fairly well though and that’s always a plus. The mouthfeel was medium bodied, dry, snappy, crisp and refreshing. It had a good amount of lively carbonation and a decent amount of flavor was left on the palate after each sip. Well, I didn’t think this beer was too bad at all. It’s definitely not the greatest beer that I’ve ever had, but I enjoyed it ok. Ta Henket is obviously a unique brew, but I found it to be super easy to drink and I think it would pair excellently with the warmer days of Spring and Summer. It became much more enjoyable as I went along and I clearly think it’s worth a try if you happen to see it. Some have given this beer mixed reviews and that’s quite alright, but for me it’s a solid beer. One that I could see myself trying again sometime in the future. Be sure to let me know what you think about the Dogfish Head Ta Henket if you have tried it. Thanks for reading and commenting everyone. I greatly appreciate all of the support and compliments. I had this on tap and wasn't a fan. But damnitt I love that label so I'll probably pick up a bottle. Thanks for reading and commenting. Yeah, you're right, that bottle is pretty cool looking. As far as the beer it was ok and I didn't have any trouble drinking it, but it definitely wasn't the best effort that Dogfish Head has produced in my opinion. I do appreciate the fact that they push the boundries of brewing however, so I usually pick up these “one offs” just to see what they are like. Be sure to check back in from time to time if you have a few extra minutes. I try to post daily. By the way, I really enjoy The Beer Circle. Keep up the good work. Glad to see you reviewed this one. I had not yet read an in-depth review. Good call! I'm glad I was able to get my hands on one. I definitely didn't think it was near as bad as people have made it out to be. I would be interested to hear your take on it for sure. It's a unique beer that was pretty fun to drink to be honest.